And Kendall Coyne Schofield is certainly fast. Making history as the first woman to ever compete at the NHL All-Star Skills Competition, Coyne Schofield demonstrated her speed and skating ability in the Bridgestone NHL Fastest Skater event. She placed seventh of eight skaters, which included event champion Connor McDavid, who edged her out by less than a second. But Schofield wasn’t the only woman involved at the annual skills rally. Brianna Decker, Rebecca Johnston, and Renata Fast were all in attendance to showcase the women’s game. Decker, in particular, was tapped to demonstrate the passing event for the NHLers and (unofficially, according to the league) finished the skills three seconds faster than any of the men. 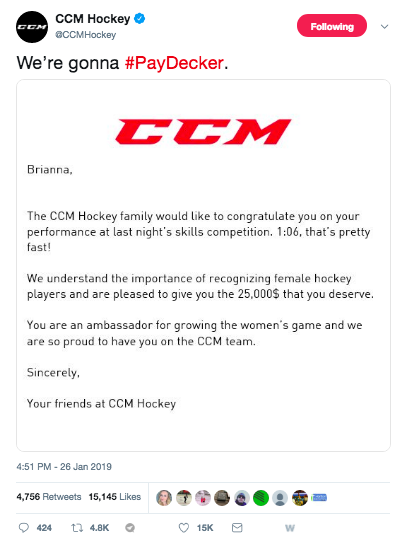 When social media took notice, CCM – a hockey apparel company – stepped in and recognized her as the winner by giving her the “first place” purse. As the competition came to a close, a bigger conversation started. This conversation wasn’t about speed or statistics though; this conversation was about inclusion, equity and respect. It was about the future of the women’s game. And it only took Kendall Coyne Schofield 14.346 seconds to get it started. This is a great story – the WHOLE story, which we didn’t hear. Congratulations ladies! You are the role models for all girls that follow in your footsteps. Get your daughter in the game!